In the course of trying to capture a deranged killer, Watch Commander Sam Vimes is magically transported thirty years into the past, to the day when he witnessed a violent changeover of power in the city of Ankh-Morpork. Forced to step into the role of his old mentor John Keel in order to guide his younger self, Vimes finds himself once more in the centre of the “Glorious Revolution of the 25th of May”. This isn’t the first fantastical choice for this series – see Robert Heinlein’s Starship Troopers – but it is one that I have been thinking about adding for a while. The works of Pratchett’s Discworld series are the kind of books that don’t immediately seem like they would belong here, but amid all of the frivolity, dry wit and wink, wink, nudge, nudge style writing and humour that Pratchett has come to specialise in, his books, especially those from the back end of his immense career, have tended to carry very deep and very serious messages. The power of individual actions in Going Postal, the magical strength of belief in Hogfather, the twisted hypocrisy of racism in Thud! And, here, the all too frequent emptiness of revolutions and regime change, in one of the most poignant and sombre parts of the larger Discworld canon. Remarkably insightful and beautifully written, Night Watch is still, for me, the pinnacle of Pratchett’s writing. 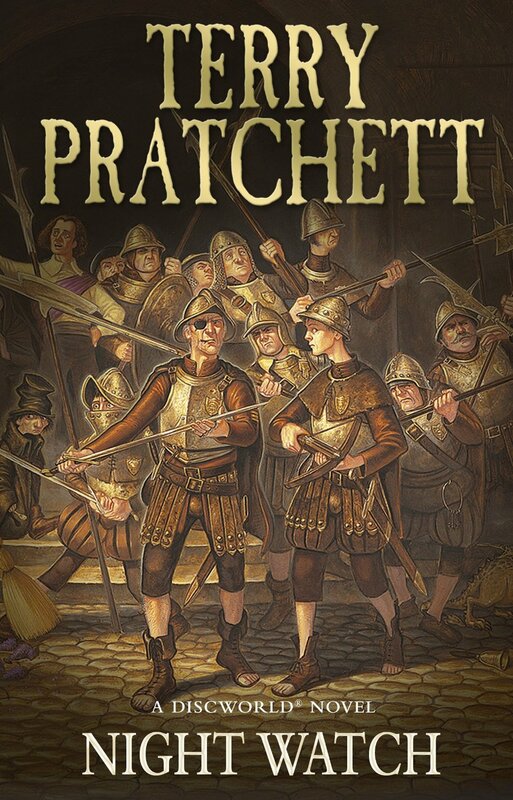 It wasn’t the first time that Pratchett had approached the topic of war – 1997’s Jingo is probably his must full on attempt at tackling the issue – but I feel like Night Watch is a much more effective approach to the idea of political violence. Moving beyond the gallows humour, the sub-plots involving assassins, the hunt for the serial killer and the many and varied cameos that litter the narrative, Night Watch has a lot to say about revolutions, why they happen, who performs them, and what you can actually expect to get out of them. There is certainly something depressingly cynical about Pratchett’s ringing judgement on revolutions: “Don’t put your trust in revolutions. They always come around again. That’s why they’re called revolutions. People die, and nothing changes.” Some might well say that it is too cynical and, in fact, too simple a declaration to be made on the topic. But, for me, it rings somewhat true, from my own study of history and my own grasp of what is going on in the world today. Even in my country, much of the discussion about the upcoming centenary of the Easter Rising is about how the “vision” of the rebels has been perverted or obstructed by those that came after, or how the wholesale dumping of Fianna Fail in favour of Fine Gael and Labour in 2011 – what some dubbed a “democratic revolution”, somewhat grandiosely – has failed to really alter the fabric of modern politics in any tangible sense. Revolutions occur, but things do not change all that much really. Real change is something that happens more slowly. You can imagine Pearse’s thoughts as part of Dublin’s more loyalist population heckled him and his men as they were led away from the burning ruin of Dublin’s city centre, or any pick of numerous more left-wing politicians in the new free Irish nation, constantly given the electoral version of two fingers to any kind of genuinely progressive or transformative program, in favour of governments constantly led by the centre option of Fianna Fail and Fine Gael. The idea of a population that actually distrusts “cleverness” is one that I feel many Irish will recognise. But this is supposed to be about war I suppose. In the course of the book, based largely off Victor Hugo’s Les Miserables in terms of direct inspiration, Vimes inadvertently finds himself leading the revolution he was largely a bystander too in his youth, one that balloons out from a small scale attempt to institute law and order in a corner of the city, into controlling nearly a quarter of it. The action however, as we learn through Vimes’ own thoughts on the matter, is largely irrelevant: the revolutionaries are determined to replace “Lord Winder” with a figure called “Snapcase”, a man who will, inevitably, end up worse than his predecessor in terms of tyrnanical behaviour. Vimes, with his knowledge of the next 30 years, is well aware of this, but finds himself willing to lead his little part of the revolution, not out of any grand ambitions of political change, but more out of a sense of duty to the people around him: both to the “coppers” he wants to teach, like his younger self, and the normal people that it is his job to protect. In that, he perhaps embodies some of the best aspects of the modern day peacekeeper, stepping between two warring factions and just trying to make sure that the body count is kept as low as possible. The rant speaks to me, again because of a connection I can draw to Irish history. Many in this country are satisfied with a simplistic and overly romantic view of the men and women involved in 1916 and beyond, seeing in their actions something to be venerated and idealised. “The ghosts of a nation sometimes ask very big things, and they must be appeased, whatever the cost”, a quotation from Pearse that has often stuck out on my mind. I can argue that such thinking is flawed and dangerous: that it can and has led to subsequent violent behaviour in the face of democratic will, that has changed little except a death count. Perhaps, as Vimes suggests, we should just let our past revolutionaries lie in terms of what we believe they can inspire us to do. This entry was posted in Books, NFB Reading List, Reviews and tagged books, ngiht watch, pratchett, reading list, reviews, vimes. Bookmark the permalink.